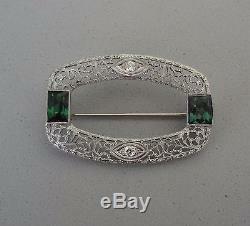 Beautiful Art Deco 14K White Gold Filigree Brooch w/ Green Tourmaline Gemstones & Diamonds. Approximate Measurements: 1" x 1 3/8" Tourmaline - 5.5mm x 4.5mm Each. Stamped: Maker's Hallmark / 14. Features 2 Emerald Cut Green Tourmaline Gemstones and 2 Fiery 5-Point Mine-Cut Diamonds, Clarity VS2, Color G. So Much Prettier Than My Photos. Ready to Wear & Enjoy. 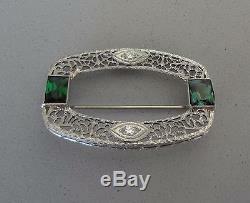 The item "ART DECO 14K WHITE GOLD FILIGREE GREEN TOURMALINE & DIAMOND PIN BROOCH 4.3 GR" is in sale since Wednesday, November 1, 2017. 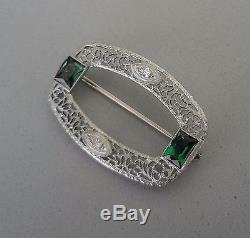 This item is in the category "Jewelry & Watches\Vintage & Antique Jewelry\Fine\Art Nouveau/Art Deco 1895-1935\Pins, Brooches". 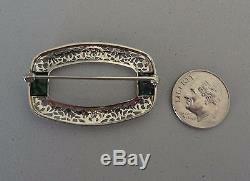 The seller is "ebco856" and is located in Moorestown, New Jersey. This item can be shipped to United States, Canada, United Kingdom, Denmark, Romania, Slovakia, Bulgaria, Czech republic, Finland, Hungary, Latvia, Lithuania, Malta, Estonia, Australia, Greece, Portugal, Cyprus, Slovenia, Japan, Sweden, South Korea, Indonesia, Taiwan, South africa, Thailand, Belgium, France, Hong Kong, Ireland, Netherlands, Poland, Spain, Italy, Germany, Austria, Israel, Mexico, New Zealand, Philippines, Singapore, Norway, Saudi arabia, United arab emirates, Qatar, Kuwait, Bahrain, Croatia, Malaysia, Brazil, Chile, Colombia, Costa rica, Bahamas, Viet nam.